How much does it cost to buy a muffin—$2? How about spending $2 to $5 to make a dozen delicious vegan muffins? I love baked goods, but I don’t want to have to spend too much money—or time—on them. This muffin mix has some decadent varieties, like chocolate chip–fudge, and some healthy ones, like bran–molasses or garden fresh. To make the bulk muffin mix you’ll need a large bag of flour, a bag of sugar, a couple of cups of soy milk powder and a few other ingredients; a large bowl in which to mix all the ingredients; and a dozen heavy-duty ziplock bags (write ‘Muffin mix’ on them, and reuse for future muffin mixes!). To make the muffins, I’d recommend you get some paper muffin cups, a stainless steel muffin tin (Teflon is bad for you); cooking spray, like PAM; and a coffee grinder for the flax seed. Keep about a cup of ground flax seed in the fridge for when you want to make muffins. It takes a half hour to make the muffin mix and put it into bags. Once it’s ready, it literally takes five to 10 minutes to make a dozen muffins, and another 20 minutes to cook. Makes enough mix for 9 batches of 12 muffins. *	2 to 3 teaspoons ground nutmeg. Combine ingredients and break up any lumps. Carefully measure 2 ¾ cups and put in zip lock plastic bag; repeat until all mix is separated into bags. Store bags in bin at bottom of fridge. Makes 12 regular-sized muffins; if you want large muffins like you get at a cafeteria, only fill 10 cups and put a bit of water into the two remaining cups. Choose which additional ingredients you want to add, and check, before doing next seven steps, if need to omit any ingredients. 1. Preheat oven to 400° F.
2. In a large bowl, put 2 Tbsp ground flax and 4 Tbsp water; let sit for 5 minutes, while preparing muffin tin. 3. Use paper cups to line tin, if you like; coat tin with or without cups with cooking spray. 4. Add to flax/water mix: 1 ½ teaspoons vanilla, 1 cup water, and up to ½ cup canola oil (the more oil, the more moist—and fattening—it will be, but you can always replace the oil with applesauce for moisture without the fat). 5. Stir in 2 ¾ cups muffin mix and any additional ingredients (listed below) just until moistened. The batter should be lumpy. 7. Bake for 18 to 20 minutes, or until muffins are golden brown. 1. Applesauce: ½ cup applesauce; omit oil. 2. Apple: 1 ½ cups raw grated apples, ½ teaspoon grated cloves, ½ cup nuts or raisins; sprinkle with cinnamon and sugar mixture before baking. 3. Banana: 1 mashed banana, ½ cup walnuts (optional). 4. Blueberry, peach, pear, plum raspberry, strawberry: 1 cup fresh or frozen fruit or ½ can large can (drained) chopped peaches or pears. 5. Bran–molasses: Use only 1 ½ cups of muffin mix. Stir in: 2 cups bran cereal, ¼ cup molasses, ½ cup raisins. 6. Butterscotch: 1 (12 oz.) bag vegan butterscotch chips, ½ cup chopped nuts. 7. Carrot: 1 cup grated carrots, ½ cup raisins, 3/4 teaspoon allspice. 8. Cappucino: 1 Tbsp finely ground coffee, ½ cup cocoa in mix; after putting into muffin cups, press a square of vegan chocolate under the surface. 9. Cashew: 1 cup unsalted coarsely chopped cashews. 10. Cherry: 1 cup fresh, dried pitted or candied cherries. 11. Chocolate chip–fudge: 1 ½ cups cocoa, ¼ cup sugar, 1 ½ cups semi-sweet chocolate chips. Ice with chocolate icing and put a maraschino cherry on top for a special treat. 12. Chocolate raspberry: 1 ½ cups cocoa, 1 cup raspberries. 13. Coconut: 1 ½ cups toasted flaked coconut (reserve some to sprinkle on the top). 14. Cranberry–orange: 1 cup chopped fresh or frozen cranberries, ½ cup nuts, ¼ cup frozen orange juice, 1 Tbsp orange peel. 15. Currant: ¾ cup currants, ½ cup chopped nuts. 16. Date–nut: ½ cup chopped dates, ½ cup chopped nuts. 17. Dried fruit: 1 cup dried diced fruit (apricots, raisins, figs, etc.) and ½ cup chopped walnuts (optional). 18. Eggnog: 2 teaspoons rum extract, 1 cup vegan eggnog (omit water from recipe) before baking, top with mixture of: 1 Tbsp sugar, ½ teaspoon nutmeg, ¼ teaspoon cinnamon. 19. Garden fresh: ½ cup grated carrots, ½ cup grated zucchini, ¼ teaspoon ground cloves. 20. Gingerbread: 1 Tbsp ground ginger, ¼ cup molasses, 1 cup raisins. 21. Granola: reduce muffin mix to 2 cups and add 1 ¼ cups granola. Top with additional granola before baking. 22. 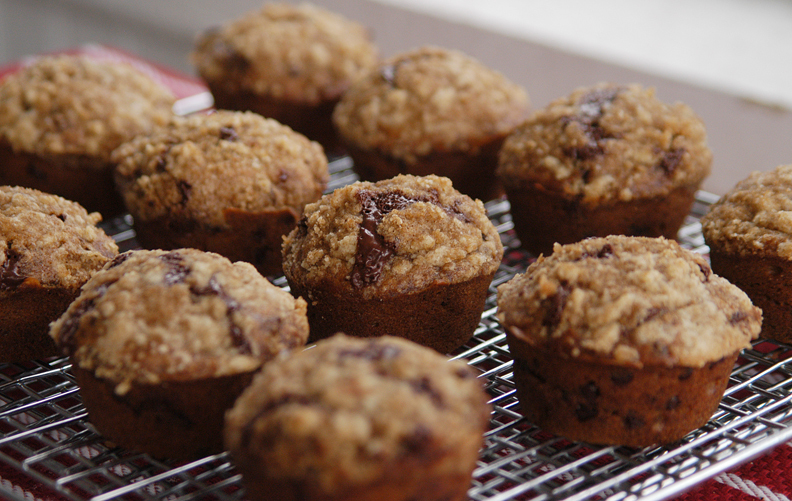 Grape nuts: reduce muffin mix to 2 cups and add: 1 ¼ cups grape nuts and ½ teaspoon allspice. 23. Hazelnut: 1 teaspoon ground cardamom, 1 cup chopped hazelnuts. 24. Incredible cream cheese: use 1 Tbsp ground flax seed and 2 Tbsp water (let sit 5 minutes). Combine 1 (8 oz.) packages vegan cream cheese, ½ cup sugar and flax seed mix. Drop this mix by Tbsp onto top of muffins before baking. 25. Jam: ¾ cup jam or preserves (strawberry, raspberry, blackberry, cherry), ½ cup chopped nuts (optional). 26. Kisses and hugs: ¾ cup cocoa, ¼ cup sugar after filling muffin tins ¾ full, drop a chunk of chocolate about 1 cm3 into the center of each muffin, pushing down slightly until chocolate is covered. Ice cooled muffins with confectioners sugar and water glaze. 27. Lemon–poppyseed: omit ½ cup water and replace with ½ cup lemon juice, use 2 Tbsp ground flax seed and 4 Tbsp water (let sit 5 minutes), 1 Tsp lemon rind (use an organic lemon, if possible, as pesticides accumulate in peel) and 3 Tbsp poppy seeds. 28. Mandarin: 1 (8-1.4 oz) cans crushed pineapple (undrained), reduce water to ½ cup, ¾ cup shredded carrots. 29. Marzipan: ½ teaspoon of almond extract. Fill muffins halfway, add a ¾’’ ball of marzipan and fill to top. 30. Maple: 3 Tbsp maple syrup, reduce water to ¾ cup; ½ cup toasted pecans (optional). 31. Marmalade: ¾ cup orange marmalade, ¼ cup chopped nuts (opt), ½ cup orange juice (omit 1/2 cup of the water). 32. Nutty: 1 ½ cup vegan peanut butter chips, ¼ cup chopped peanuts. 33. Oatmeal: reduce muffin mix to 2 cups and add ½ cup oats, use 2 Tbsp ground flax seed and 4 Tbsp water (let sit 5 minutes) and up to 1 cup raisins or grated apples. 34. Orange: 1 cup vegan sour cream, ½ cup nuts or coconut (optional), 1 cans (11 oz. each) mandarin oranges, drain; use 2 Tbsp ground flax seed and 4 Tbsp water (let sit 5 minutes). 35. Peanut butter banana: ½ cup peanut butter, ¼ cup chopped peanuts, 1 ½ mashed bananas. 36. Peanut butter and jelly: ½ cup peanut butter, ¼ cup chopped peanuts; drop ½ Tb. jam into each muffin before baking. 37. Pineapple: ½ teaspoon ground cloves, ½ large can crushed pineapple, drained ½ jar (7 oz. or about ½ cup) macadamia nuts, chopped. 38. Pineapple–carrot–raisin: ½ cup each: grated carrots, crushed pineapple, drained and raisins, ½ cup walnuts, chopped (optional). 39. Prune: ½ to 1 cup chopped prunes, 1/6 cup poppy seeds. 40. Pumpkin: 1 cup or ½ can solid pack pumpkin, ½ Tbsp pumpkin pie spice, ¼ cup each chopped pumpkin seeds and raisins; sprinkle tops with ¼ cup pumpkin seeds and a shot of cooking spray. 41. Rum–raisin: 1 ½ teaspoon rum extract or 1 ½ tablespoons rum before baking, top with mix of: 1 teaspoon sugar, ¼ teaspoon cinnamon, and ¼ teaspoon nutmeg. 42. Sesame seed: ½ cup toasted sesame seeds before baking, top with mix of: ¼ cup nuts, 2 Tb. brown sugar, 2 Tb. sesame seeds, 1 Tb. Flour, ¼ teaspoon each cinnamon/nutmeg. 43. Sour cream: omit one cup of the water and add: ½ cup vegan sour cream, 1 cup nuts, 1 teaspoon grated lemon peel (opt.). 44. Sweet potato: ½ Tb. Allspice, 2 Tb. dry orange peel, 1 cans (10 oz each) sweet potatoes, mashed, well drained (about 1 ¼ cups). 45. Tropical treat: ½ cup dried mango or papaya, chopped ½ cup chopped banana chips or 1 fresh mashed, ¼ cup macadamia nuts, chopped, ¼ cup coconut, ¼ cup vegan sour cream, 1 teaspoon lemon peel, grated. 46. Vanilla: 1 package vegan vanilla chips. 47. Walnut muffins: ¾ cup chopped walnuts. 48. Wheat germ muffins: 1 1/3 cup wheat germ, use 2 Tbsp ground flax seed and 4 Tbsp water (let sit 5 minutes), ¼ cup extra water before baking, top muffins with mix of: ¼ cup wheat germ, 1 Tb. sugar. 49. Yogurt: reduce water to ¾ cup and add 1 carton (8 oz) soy yogurt, plain or flavoured. 50. Zucchini: 1 cup grated zucchini, 1 Tb. cinnamon, ½ cup chopped nuts (optional). “Cooking spray (like PAM)” is also pretty scary… check out the ingredients! They may include isobutane and propane… yikes!